Here is a partial list of low-down, dirty, no-good tricks that Nick “Soul Train” Shinholster recently pulled on his fellow wrestlers. He poked Izzy “The Aztec Warrior” Reyes in the eyes. He rubbed his Lycra-clad bottom in Barry Delaney’s face. He sneaked up behind Gabe “The Weasel” Weisel, tripped him, and pinned him to the mat. He grabbed Tony “Southside Slugger” Graves in a headlock, scanned the audience for Graves’ mother, locked eyes with her and shouted “I am the greatest!” while slapping Graves roughly on the back. About 25 people sat on folding chairs in a former warehouse in Nutley. They booed and booed. Eventually the wrestler Justin Adams ended the match by yanking Shinholster to the mat by his face. Everyone cheered. Informed later of Capela’s opinion, Shinholster giggled. Shinholster is not a natural wrestler. At 6-foot-1 and 210 pounds, he is big enough to command the ring at the International Wrestling Federation, the school in Nutley where he has practiced almost every day for the last two years. But he is too slow and uncoordinated to land flashy moves like back flips and roundhouse kicks. “Physically I’m the worst athlete here,” he said. Nevertheless, Shinholster hopes someday to perform in the same ring as John Cena, Brock Lesnar and other behemoth stars of World Wrestling Entertainment. The company, known as WWE, regularly attracts 3 million viewers to "RAW," its weekly television show. Last year WWE earned revenues of $729 million, according to its 2016 financial report, making it the top destination for would-be wrestlers. Shinholster’s opponents highly doubt his ability to reach wrestling’s highest echelon. Not everybody in the WWE wears tights, however. Every episode of "RAW" features a supporting cast of referees, team managers and announcers to embellish plot lines and magnify the brutality of blows. If Shinholster can’t join the WWE as a wrestler, perhaps he can talk his way in. For as long as Shinholster can remember, wrestling has held him transfixed. At age 4 he would sit on a couch and watch wrestling on television beside his grandfather, both of them struck mute by the parade of pile-driving, body-slamming super-humans. Later, in middle school, he weighed 230 pounds and stood a few inches shy of 5 feet. He was nerdy, and other kids picked on him. Shinholster was a fan of “Stone Cold” Steve Austin, portrayed in professional wrestling as a beer-drinking redneck who avoided throwing the first punch, but instead taunted others into starting fights. He stole Austin’s strategy. When someone teased him, Shinholster repeated every word the other boy said. The tormentor often found this so annoying he’d lash out, giving Shinholster an excuse to punch back. 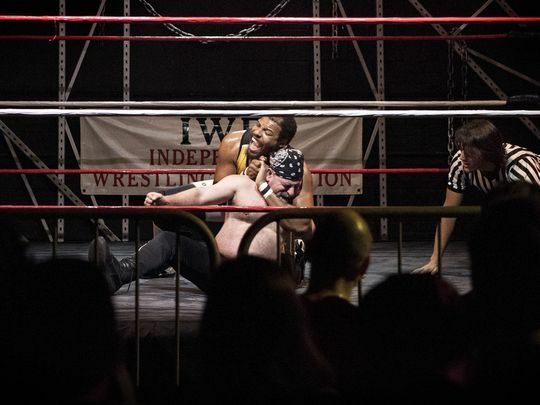 Shinholster remained an avid fan, but he never considered becoming a wrestler until May 2015, when he attended a match hosted by the IWF wrestling school. Three days later, he enrolled. Shinholster started wrestling five days a week. He loved it. But he was awful. The fights and moves of professional wrestling are intricately choreographed, requiring the combatants to work together like a pair of figure skaters. But not only was he clumsy, he also was bored by the mechanics of proper footwork and hand placement. By punching too hard, kicking in the wrong places and placing his feet at sloppy angles, Shinholster often injured the wrestlers who were becoming his friends. This April, everything changed. Somebody grabbed him in a headlock take-down, and Shinholster’s head hit the mat hard. The slam broke bones in his inner ear and gave him vertigo. Soon he realized that the only way to avoid passing out in the ring was to move carefully, plotting out every punch and kick. Shinholster lives with his grandmother, whose Teaneck home is decorated with hundreds of fragile ceramic and glass figurines, and whose living room walls are covered with mirrors. He couldn't afford a full-size wrestling practice dummy, which can weigh more than 150 pounds and cost $400, so he improvised with a beige Valentine's Day teddy bear that stands 3 feet tall and wears a red chiffon bow tie. The bear is Shinholster's practice partner. To perfect his power bombs and suplexes, he loops one of the bear's fluffy paws around his neck, supports its waist with one hand, and falls backward onto his grandmother's sofa cushions, which are helpfully covered in plastic. As he lands, he uses the mirrors to check his sparring partner's position, making sure the bear's back is flat and its neck untwisted. "OK, little bear. You have an issue? You wanna fight?" Shinholster said one recent afternoon as he punched the bear in the belly. "Mr. Bear, you're crazy!" Shinholster also has refined his character. At first Soul Train was a stereotypical bad guy, taunting other wrestlers and cursing the audience. “He’s nothing but a goof,” his mother said. Shinholster was a student at Bergen Community College. He took a break to earn money as a clerk for a shipping company, which laid him off this spring. He plans to return to school this fall. In the meantime, wrestling is his unpaid, full-time job. Audience members sometimes taunt him by combining “banana” with certain curse words, which Shinholster quickly disarms. The vest is studded with metal spikes along the collar. Before a match recently, Shinholster was asked if the spikes ever stab him in the face.